The breadth of artistry across nearly a decade plunges both audience and the Montreal-based artist into a flutter. Amanda Dawn Christie says numerous times she thought she was ‘done’ with this material. Instead, she explains, she stayed open to further artistry with the massive library of recordings at the shortwave radio transmission site on the border between New Brunswick and Nova Scotia in Eastern Canada. Out of such focus has come five iterations of Requiem for Radio. 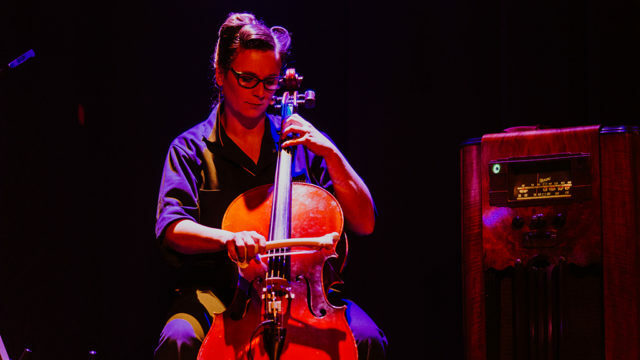 “Listen here,” she seems to beg of our curiosity via shortwave signals, drone tones, theremin twangs, even cow bones morphed into lo-fi transmitting loop antennas on a newly made cello. Read more of Christie’s ideas.